OK, I know I keep promising videos but instead, I keep making things....With Hello Thursday galloping towards us, it may be end of week before I get going on the videos. There are some great things coming out this Hello Thursday so it will be worth the wait! Using the new Cricut Anniversary Expression 2's pre-loaded cartridges, I made these two cards. This first card was made using the Cricut American Alphabet cartridge. This cartridge not only has three great fonts, it also has pre-made, layered word art and images. I cut this present at 5", all layers. I cut another shadowed layer in white and created my own faux welded card by scoring the white layer and just gluing above the line. It's a simple, quick way to make a shaped card. The "for you" was cut at 1-1/2" and pop dotted up on the card. 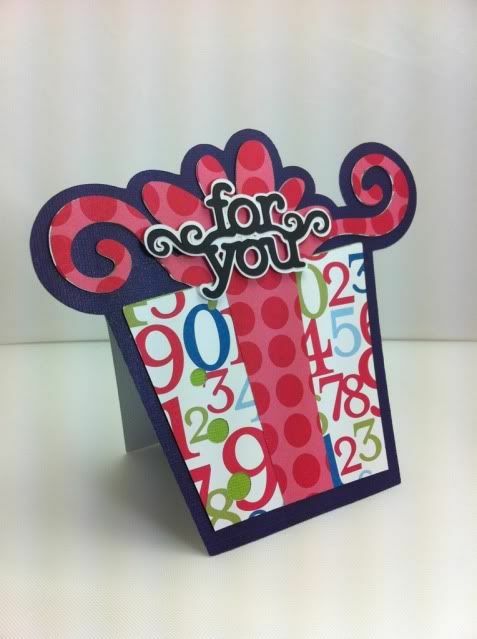 Paper is by Stampin Up! Next, this quick, graphic 4-1/4" x 4-1/4" card was made using the Cricut Essentials cartridge which is also preloaded onto the Cricut Anniversary Expression 2 machine. I cut the three layered flowery squares at 1-3/4". The "hi" was cut from the Cricut American Alphabet cartridge at 1". 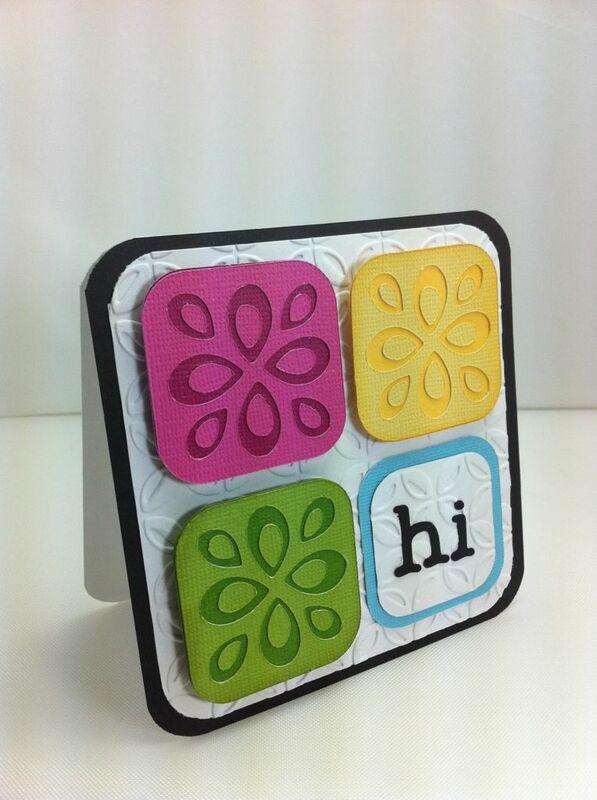 I embossed the background white using the Cuttlebug and the large folder from the Preserves Cuttlebug set. Paper was by Core'dinations. twi cute cards, the second is my favourite! Great cards.....I can't decide luv them both!! I'm a sucker for gifts when it come to cards and LO...but love layering and embossing...I think you and Joy have way too much fun..OH...geeze.....wait a minute..rewind...no such thing as to much fun.....you both ROCK!!! So cute! I will be making both of them but the first one is my favorite! TFS! The embossing is a really cute addition to this card! Great cards! Love the ideas! I really like the cards that you made. Thanks for sharing! Super Awesome cards! I love them!! Can't wait to see the launch of the E2. Thanks for the cute card ideas . . .think I'll be using the simple, graphic card sometime very soon! Both cards are soo great...second one is my fav!! Totally love both cards - so cute! These are so cute! You do such a fantastic job!!! Really cute cards! Think the second is my favorite! 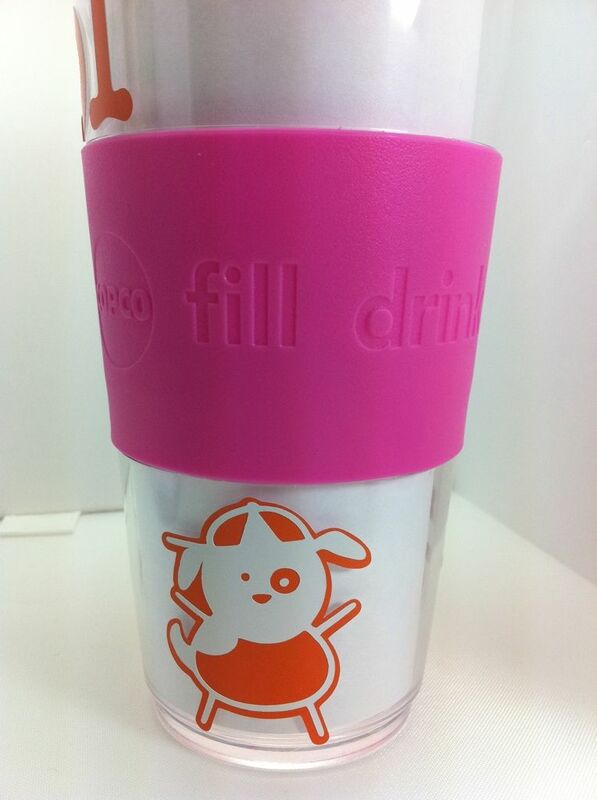 Love the cup too! Thanks for sharing. I love love love the 2nd one best. Such a simple but stunning idea! I have this cart and will have to try it when I get home! So cute! Love all the bright colors on these cards. Those cartridges on the E2 seem really neat! Wish I had one! I just love the cards. The first one is my favorite. The cards are beautiful. It amazes me that you keep coming up with ideas week after week! i like the hi card. It would make me smile if i received something like it in the mail. Cute cards. Fantastic idea of the cups. May have to steal that idea since I am the designated dishwasher. These are great!!! So many good ideas! two great cards!! all your work is great!! I love the HI card and the cup. Makes me want and Expression 2! These are great! I love these cards and just can't wait for the E2! I especially love the Hi card!! Too cute! Love the for you card. It is so cute. It would be perfect for kids. I love the "For You" present card...really creative of you!! Thank you for always showing us cretive things and sharing coupons! These are great cards!! Such great inspiration!! I hope to get a Expressions 2 someday. Fabulous cards. I love shaped cards. One day soon I am goig to try one. I have Design Studio but don't know how to use it very well. I guess I will have to just jump in and try it. Thanks for sharing your craft.